Romanians celebrate the parliament's decision. The Romanian Parliament rejected Tuesday revisions to general mining rules that would’ve helped the development of key projects, including Gabriel Resources (TSX: GBU) Rosia Montana gold mine, Europe's largest open cast gold operation. According to opposition group Save Rosia, the lower house voted against the new framework 105 to 160, short of the 204 ballots needed to pass amendments to the mining law. These changes would have allowed miners to continue with their projects as far as they used the most advanced technologies to protect the environment. 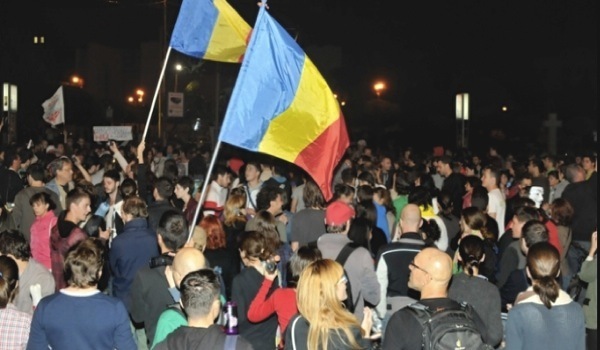 Several hundreds protesters gathered before the vote outside parliament as well as in the city of Cluj, chanting "Save Rosia Montana" and demanding lawmakers to vote against the revisions to the country’s mining law. Today’s setback is only one of the many the Canadian company has suffered lately on its flagship gold and silver project in Romania. Only last week, its subsidiary Rosia Montana Gold Corporation (RMGC), made the news because it is being investigated by Romania for alleged money laundering and tax evasion. For the last year, and with more intensity in the last three months, Romanians have been protesting what they say is an environmentally risky project and a larger problem of political corruption. Last month a Romanian parliamentary committee rejected the project, forcing Gabriel to push it back several more months, and upping costs to about $1.5 billion. Meanwhile a group of environmentalists sent Thursday an open letter to Canada’s Foreign Affairs Minister and members of parliament, demanding the prompt introduction of legislation to make local firms, particularly extractive industry corporations, accountable for proposed projects and actual operations abroad. The group has also requested Ottawa to withdraw its support for Gabriel Resources' project. The Canadian miner has already spent more than $500 million on the project in a region of Transylvania where mining dates back to the first century, since it first acquired the concession in the late 1990s.